Also, this specific book and I have some history, which I will get into later on. 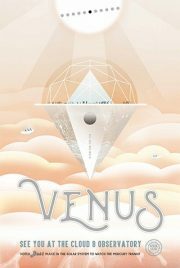 Chilo isn’t Venus but it’s a lot like Venus, from the dense atmosphere to the furnace temperatures down on the ground. The good news is that like Venus, Chilo does have a region where the temperatures and pressures won’t immediately kill humans. The bad news is that region is thirty kilometers above the surface. Which brings us to the balloon-cities of the sort featured in that gratuitously embedded image above. Chilo’s armada of cities were built in the days when humans were ruled by the alien satraps. Freedom came at a price: with the satraps driven off, the alien technology on which the cities depend for survival is no longer available. For now, the solution is for young people like Timas to cram themselves into increasingly fragile armoured suits to scavenge the surface of Chilo for usable alien relics. Slow but inevitable decline is suddenly interrupted when Pepper crashes into the floating city of Yapatek. Most off-world visitors arrive in a space ship. Pepper shows up in a space suit and improvised reentry gear, falling at terminal velocity. An interstellar man of action of quite some accomplishment, Pepper was fleeing a menace he could not hope to overcome single handed: a zombie swarm, its unfortunate victims commandeered to serve some alien purpose. And the Swarm is coming for all Chilo…. You may notice some very loose parallels between Buckell’s setting and Bob Buckley’s Life in the Clouds. It’s much more likely that you are looking at me blankly, having never heard of Buckley’s Life in the Clouds. Here, have a review. I know for a fact Buckell was not riffing on the Buckley novel1 when he created his floating cities. Instead, he was drawing on this interesting work by Geoffrey Landis. Now, as far I know Landis hadn’t read the Buckley either. I think what we have here is yet another instance of independent invention. For example, a space elevator was first proposed by Artsutanov in 1959, and then by Isaacs, Vine, Bradner, and Bachus in 1966, then Pearson in 1975 … and I think I may be missing at least one independent invention of the idea2. Although this book builds on the events of the two earlier books, 2006’s Crystal Rain and 2007’s Ragamuffin, you don’t need to have read either of those to understand the big picture and how Chilo fits into it. The Xenowealth setting is not an especially kindly one. If I can draw a strained analogy from ecology, humans are the equivalent of an island species that has stumbled onto a vast continent. We evolved to be the smartest tool-users on Earth. The Milky Way has been home to a wide variety of smart tool-users for a very long time; there has been competition and the survivors are the brightest of the remaining tool-users. It is very possible that the surviving aliens might be smarter than humans. This is not a Humans Uber Alles setting. Not at all. I found Pepper, the protagonist, rather hard to like. (He appears in other Xenowealth books and I wasn’t crazy about him there, either). Timas, on the other hand, is a more engaging character. If Buckell had given Timas a larger role, and downplayed Pepper, the book would have been more like a fine old-fashioned SF juvenile, and I would probably have liked it better. Still, I liked it just fine as it is, and would recommend it. Sadly, other readers do not seem to have warmed to this book as I did. Perhaps the book lacks that old American can-do, that optimistic belief that the US will always be top dog, technologically, economically, militarily. Buckell was born in Grenada, a nation not known for its ability to cruise missile its way out of any problem. People with personal experience of life in minor powers may well take a different perspective on the Great Game, one that differs markedly from that of the average American. But Americans are presumably Buckell’s main market. Or it just might be some other factor. Whatever the reason, Tor dropped the series. Readers wanting more installments faced only disappointment. But we live in a new and happy world of self-publishing. After a delay of four years, Buckell brought out Apocalypse Ocean, the fourth book in the series. The system works! All of Buckell’s books, Xenowealth and more, can be purchased here. 1: Because I asked him; he explained that he wasn’t reading Analog when the Buckley serial ran because he was too busy being a fetus. 2: Konstantin Tsiolkovsky proposed something similar, but he was thinking of a structure under compression (like a building), not something under tension (like a suspension bridge).